I can tell fall will be here soon since the birds have started helping themselves to the seeds. 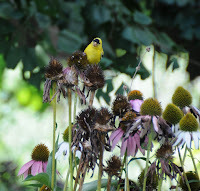 Here is a finch on the purple coneflowers. I haven't had time to read the 400 page booklet for my camera yet so the picture isn't the greatest. When I first started gardening I spent a lot of time deadheading spent blooms so everything looked real tidy. 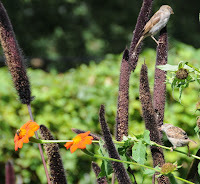 Then I happen to catch finches all over my coreopsis and started reading up on the flower seeds that birds love to eat. Now everything pretty much looks ratty from late summer to fall. I love watching the birds though. Here is some purple millet that a few sparrows are feasting on. I guess fresh millet is the way to go since nobody seems to like it in the bird feeder mix. We now only serve black oil sunflower seed which is as pricey as black oil. The prices are soared this year so next year its very likely that we'll be growing more food for the birds. Those finches also love sunflowers. They're devouring all of mine right now. I leave the coneflowers, coreopsis, and native grasses with their dead blooms up, too. In fact, I plant those things just so I have lots of fall and winter bird visitors (and summer bugs and butterflies visiting the blooms)! My garden is full of dead blooms now. I didn't plant sunflowers this year and I regret that. I running out of space but I think that is something I'll have to make room for next year.